The funeral of George A. Faneuf, a veteran of the Civil war and resident of Lowell for over 45 years, took place yesterday at 8:30 o'clock from the home of his daughter, Mrs. Thomas H. Kelley, 9 Plymouth Street. In attendance at the funeral were the following delegations" Post 120 GAR, Quartermaster Nevers, Senior Vice Commander Clogston, Officer of the Day Patenaude, Commander Barrett, and Post Commander Flanders; the B. F. Butler Woman's Relief Corp. 75, Aura E. Lindquist, S.V.P., Helena Quinn, P. P., Mary Prescott, Mary Day, Annie Mahoney, Catherine Frawley and Nellie Donahoe; the Mary E. Smith Tent, Daughters of Veterans, Mrs. Grace E. Noonan, S.V.P., and Mrs. E. Bakke; At St. Rita's church at 9 o'clock, a funeral mass was celebrated by Rev. C. J. Cotter. The choir under the direction of Miss Marie J.C. O'Donnell sang the Gregorian chant and the solos of the mass were sung by Mrs. Thomas Vaughan and Frederick Cummings. Miss Marie J. C. O'Donnell was the organist. There were many beautiful flowers. The bearers were George W. and Charles L. Faneuf, sons, Thomas H. Kelley and Edward Bourassa. At the grave Rev. Fr. Cotter read the committal prayers. The burial was in St. Joseph's cemetery under the direction of Undertakers James F. O'Donnell & Sons. 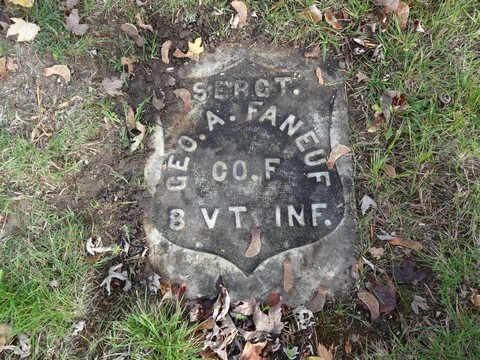 Military Record: FANEUF, GEORGE N., St. Albans; enlisted 11/23/1861, mustered in 2/18/1862 as Private in Company F, Eighth Vermont Infantry; re-enlisted 1/5/1864; promoted corporal 7/1/1864; promoted Sergeant 5/18/1865; mustered out 6/28/1865. Source: The Lowell Sun, October 20, 1925; Lowell Courier-Citizen, October 20 and 23, 1925; Revised Roster.